Annabel Allers, a third-year graphic design student at the North-West University’s (NWU’s) campus in Potchefstroom, will be releasing her first book in October. 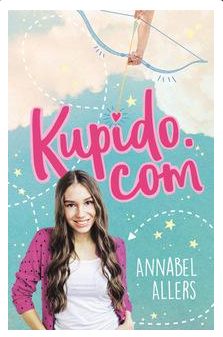 The book titled Kupido.com is a funny romantic Afrikaans novel for teenagers that aims to inspire youngsters to be themselves and not change who they are because of peer pressure. Annabel, a 22-year-old who is originally from Pretoria, says she has always had a passion for writing from a very early age. “I started taking my writing more seriously during my first year at university and it paid off,” she said. In 2015 she wrote and entered her book Kupido.com in a youth novel competition organised by Lapa (an Afrikaans publishing company), and made it to the top-three. She then received a call from Lapa saying that they would like to publish her book. According to Annabel, the hardest part of writing the book was having the self-discipline to sit down and write every day. The best part of the entire journey is finally having the book published. After graduating Annabel wants to pursue a career in book illustration and she wants to continue writing more children’s books. “Most people wonder why I choose to write children’s books and all I can say is that I have always loved writing and reading books for teenagers,” she concludes. Annabel is currently writing her second offering which she also hopes to publish.